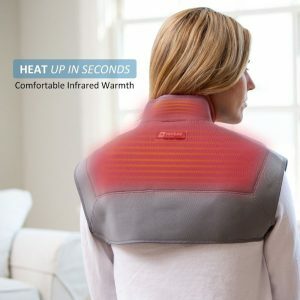 Infrared heat therapy, as used in our heat wraps for the neck, back and shoulders, is a safe and comforting method to apply heat that is very targeted to the area of pain and penetrates deeper than typical hot packs and heat wraps. Infrared heat therapy is an effective means to benefit from the therapeutic effects of heat, such as improved blood circulation, relaxation of muscles, promoting repair of tissues and rehabilitation of restricted motion. A deep penetrating form of heat that uses invisible waves of light, producing a radiant type heat that penetrate about 2 to 3 inches under the skin surface, while avoiding any damage. The effects are therapy to the blood vessels, muscles and tissues, causing increased flow of blood and oxygen. 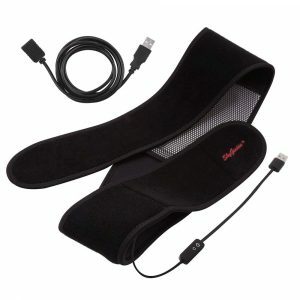 The penetrating warmth helps relax stiff muscles and loosens joints. These products apply infrared directly to the desired body part. The neck, shoulder & back units are available in a plug-in or battery powered, allowing freedom of motion, with the neck and shoulder ones available in 2 sizes. The last one is a universal type pad that uses plug-in only but can be applied to most any area, making it the most versatile of the infrared heat applications. The ability of infrared to penetrate deeper than other forms of heat therapy means increased healing at the cellular level and better elimination of toxins. The benefits are easing of chronic pain through blood flow stimulation, helping to supply important nutrients and oxygen, as well as helping to heal injuries quicker and more efficiently than standard heat therapy. 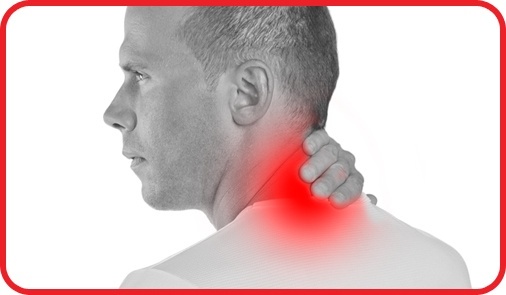 This form of heat therapy allows the infrared to supply heat to areas of the neck, back and shoulder that are deep, therefore, more resistant to heat therapy by usual methods. The heat is applied directly to the deeper areas of joints and tissues, without chemicals used with some heat wraps and without the use of electromagnetic fields generated by some of the higher voltage electric heating pads. How Does Infrared Heat Therapy Work? The form of infrared therapy used in therapeutic heat wraps is called far infrared, which produces waves of energy in the spectrum of light, however, they are not visible to the eye. The infrared rays permit heat to deeply penetrate into the body in a process known as thermal conversion. 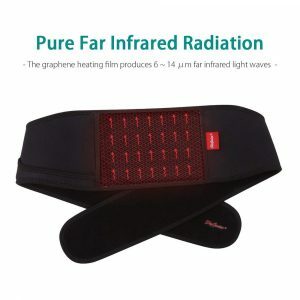 While conventional heat wraps and hot packs mainly apply heat to the surface of the skin and underlying fat tissue, the infrared rays penetrate heat deeper into muscles, tendons, ligaments, joints and bones, which optimizes the healing effects of heat. As the infrared energy is converted to heat, small vibrations in tissues allows pain relief at the cellular level. What Are The Benefits Of Infrared Heat Therapy? By utilizing far infrared heat, therapeutic benefits are more effective when the objective is to influence blood vessels, nerve receptors, lymphatics and other structures as compared to standard hot packs and wraps. 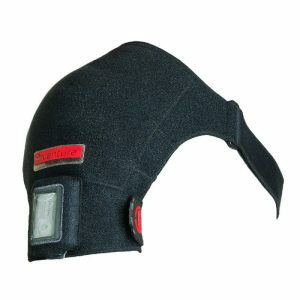 Heat application is frequently used for rehabilitation in office and home settings. It can alleviate stiff joints, provide relief of muscle spasms, decrease chronic inflammation, while enhancing blood circulation intended for for faster healing times. While there are standard methods to apply heat at home, like electric heating pads, microwaveable hot packs, hot water bottles and chemical based patches, infrared heating pads have some benefits to these commonly used products. Most forms of heat treatments necessitate a high temperature in order to penetrate sufficiently. Working with these high temperatures poses a greater risk of burns. Products using electric currents to provide heat can generate electromagnetic fields at high levels that may be detrimental to health. Microwaveable products generally are initially hot and will gradually cool producing an inconsistent level of heat and requiring frequent returns to the microwave oven to re-heat. Heating packs using chemically activated oxidized heat can not regulate temperature, may be costly in long term usage and are not very environmentally friendly. The infrared wraps utilizes technology which is both safe and comfortable, the benefits of deeper penetrating heat for pain relief and rehabilitation with lower temperatures and lower voltages. 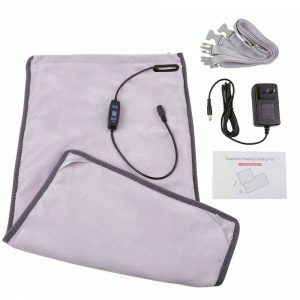 Instead of using a energy source with a high voltage of 100 to 120 Volts, the infrared heat wraps utilize 12 Volts for models that plug in or a rechargeable lithium battery for those who prefer freedom of motion. Therefore, better heat penetration with lower temperatures, ability to control the temperature setting with no harmful electromagnetic generated fields are benefits that make infrared heat therapy safer and more effective for chronic aches and pains. Infrared heat lamps frequently are used in chiropractic and physical therapy clinics due to their effectiveness as well as their beneficial attributes for wellness. Having an effective and affordable method to use this technology in the comfort and convenience of your home or when traveling is very beneficial. A 2015 study in the journal Evidence-Based Complementary and Alternative Medicine provides some evidence that far infrared therapy can help heal injured nerves and reduce inflammation. What Is Infrared Heat Therapy Like? It is different than standard forms of applying heat and the experience is different. With traditional microwave or electric hot packs, there is an overall sensation of heat and this can be a bit overwhelming. While feeling good, the facts are mainly superficial. 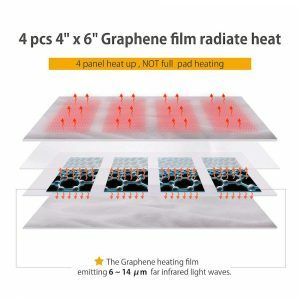 Infrared heat uses carbon fibers to emit far infrared rays, which is more therapeutically effective than superficial heating methods, and will feel less hot. After application, the skin begins to turn red and a sense of warmth is perceived. It is not extreme like some forms of superficial heat, but it does not need to be, because it uses a different form of penetration. The redness and effects may be felt up to 45 minutes after application. So, there is an almost instant feeling of warmth, then relaxation and sedation with an anti-spasm effect, decongesting chronic swelling and providing varying levels of relief, depending on the condition. Infrared will not feel as hot as traditional hot packs and one needs to understand this. Just because there is not as much heating sensation, this does not mean it is not as effective. In fact, the opposite is true. There is deeper penetration and a more targeted application of heat. These effects can often be noted in hours or even the next day and, when compared to standard hot packs, you can often notice a better therapeutic effect. Therefore, in general, initially, hot packs feel better, but in the long term, healing is more effective with infrared and it is personally my preferred method of applying heat to the neck, back and shoulders. So, don’t be too judgmental at first by feeling it is not as good as standard hot packs because it is not as hot. There is a heat sensation, but the main effects are noted deep in the tissues and better healing is promoted. A 30 minute treatment is typical, however, the target can be changed and treated again from a different angle or location. Because it is more targeted, the feeling is not as all encompassing as a standard hot pack. The infrared application uses a section of the hot wrap to provide the treatment. When Should I Use Infrared Heat Therapy? Heat in general is not for acute or recent injuries. 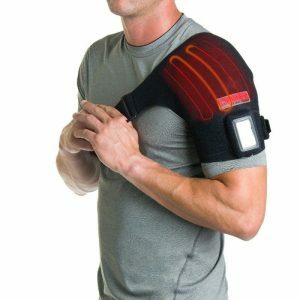 Because infrared penetrates so well, it is a great therapy for chronic conditions like neck, back and shoulder problems. Indications are arthritis, nerve irritation, sub-acute and chronic sprains, strains and stiff joints. Apply to affected area for 30 minutes, rest for a period and then a mild massage is nice to disperse residual heat and aid in relaxation. Always follow instructions and pay attention to any warnings. 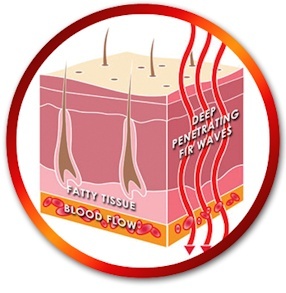 It is recommended to have a layer of clothing under the heating pad, however, infrared waves will penetrate through clothing and will not effect the heating capacity. The precautions are the same for other forms of heat therapy, i.e., during pregnancy, over wounds or lesions, implants and when there is altered sensation, where an individual may not be able to feel the infrared heat therapy and avoid injury. Consult your health care professional for your specific concerns.